Yuneec has a rich history in flight. Inspired by the feel and joy of soaring through the air, they have been building drones to try to bring those feelings to anyone. Offering a small yet capable selection of multi-rotor craft, Yuneec satisfies your basic needs of a toy craft up to your commercial bridge inspection and more. 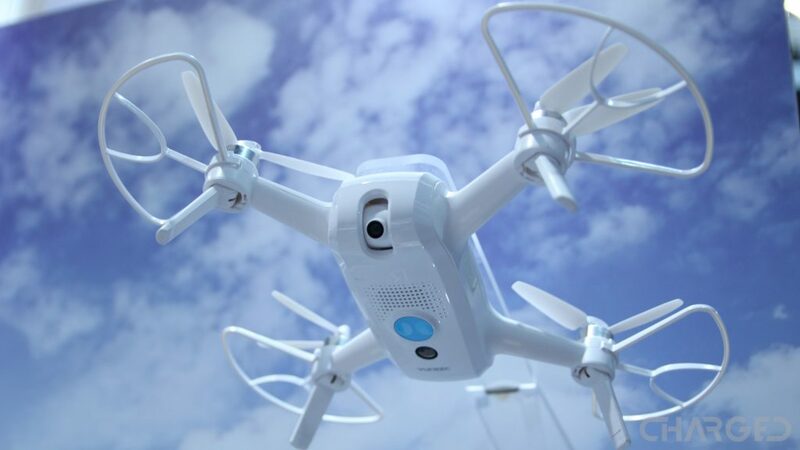 The drones are solid, and machines like the H520 proves software is part of the magic. Made popular for their larger folding machines, join us for a brief rundown, our Yuneec drones guide. First, let’s explain that the small UAS that we’re talking about today are not a part of Yuneec’s larger operations. 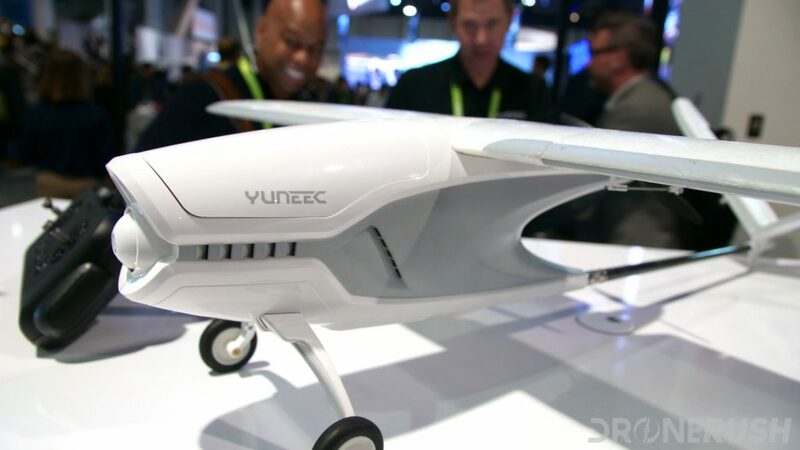 Up until 2014, Yuneec operated in the U.S. building manned craft, mostly single seat electric planes, under the banner GreenWing International. Closing the doors on the manned craft operations, Yuneec has put extra effort into putting cameras into the sky. Their list of drones is short, but they’ve put a lot of thought into their machines. 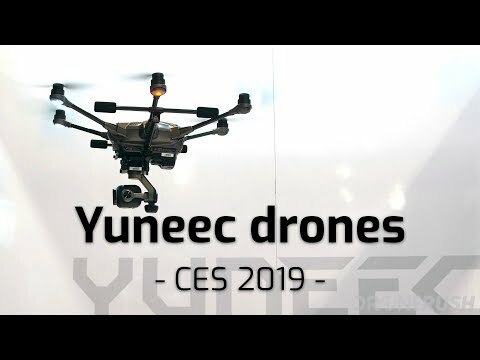 Yuneec is one of the only major brands that does not have a semi-ripoff direct competitor to the Phantom drone. Announced in August 2018, the Yuneec Mantis Q is a compact, folding drone with a super price tag. Going by the spec sheet, we expect the Mantis Q to operate somewhere in between the DJI Spark and DJI Mavic Air. That makes it solid competition to the GDU O2 and new Parrot Anafi. Each of these machines have their own merits, and the standout aspect of the Mantis Q has to be the voice operated controls. That’s right, hand gesture controls are still cool, but issuing verbal commands to your drone has way more operational potential. 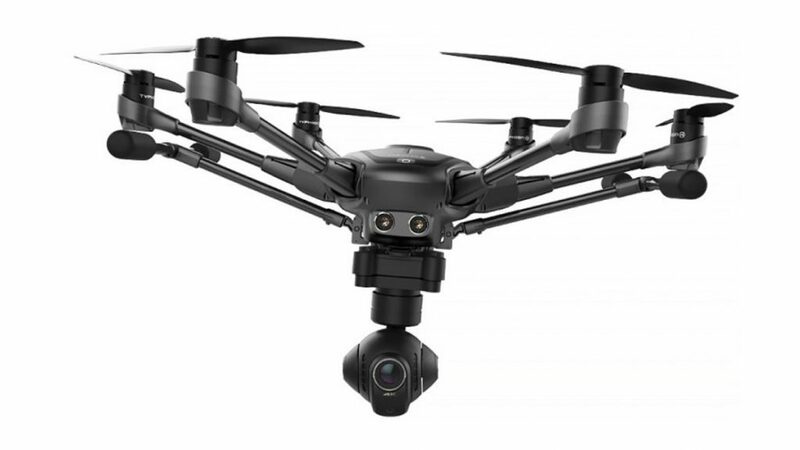 Pick up the Yuneec Mantis Q for $419 today. 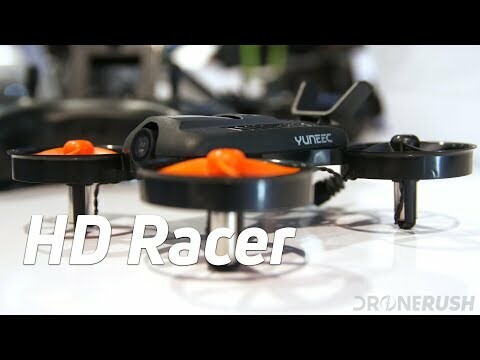 Announced at CES 2018, the new HD Racer is a fun little quad for the beginner race pilot. This is a zippy little machine that will help you get the hang of racing, just don’t expect it to keep up with the high speed machines of an official race track. The best feature of the HD Racer is a crash recovery feature, if you land upside down, and you probably will, just tap the recover button and the drone will pop itself upright. It’s really cool, and smart. You can look to buy the HD Racer later in 2018 for $178. Update: It’s now 2019, the HD Racer is not yet up for sale… The last time we chat with Yuneec about this, they informed us that the drone may still land in European markets, but the U.S. should not expect it anytime soon. We’ll update if this changes. Certainly not their first drone, the Breeze is a compact flying machine that is made for hobby pilots to just enjoy. The optional FPV headset and remote make for one of the better drone packages under $500. Yuneec recently added live streaming to the Breeze, sending your aerial video direct to your social media following. Packing a 4K camera and a take-off weight under one pound, you can fly by mobile device or remote for about 12 minutes. Stepping up from the Breeze… No, that implies that the Yuneec Typhoon 4K is only a slight change from the Breeze. In fact, the camera alone on the Typhoon is almost the same weight as the entire Breeze aircraft. Breeze almost fits in the palm of your hand, the Typhoon 4K is close to two feet from corner to corner. A larger craft made for stable and smooth video. As the name implies, the Typhoon 4K hangs a 4K camera off of a multi-axis gimbal. 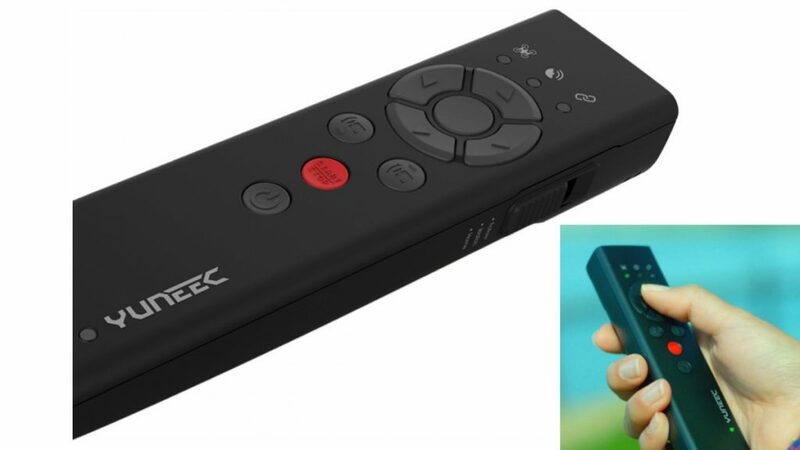 Flight time is upwards of 25 minutes and the remote has a built in 5.5-inch touch display. Check out the Yuneec Typhoon 4K for $499 on Amazon today. Less if you buy refurbished. 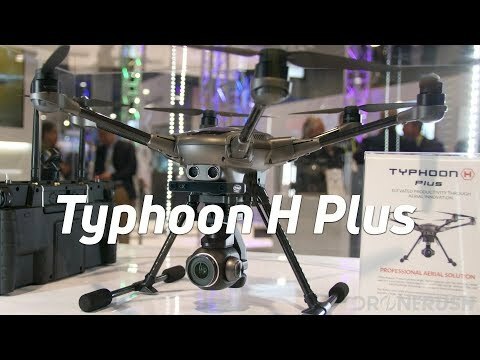 Yuneec Typhoon H Plus – officially shipping July 1, 2018! Announced at CES 2018, the new Typhoon H Plus is more than just an iterative update to the Typhoon line. It’s a major overhaul of the innards of the drone, from the software to the ESCs and propeller motors. The Typhoon H Plus is quieter, more efficient and as safe as ever. The propellers are still non-folding, but they have a nifty quick release button. Look for new cameras for this drone, including the first 4K shooting 20 MP module. Don’t forget that the landing gear lifts up and the camera gimbal spins 360 degrees. Also, the top model includes the Intel RealSense module once again, great for your self-piloted flight features. Save up $1799 to grab your new Yuneec Typhoon H Plus later in 2018. 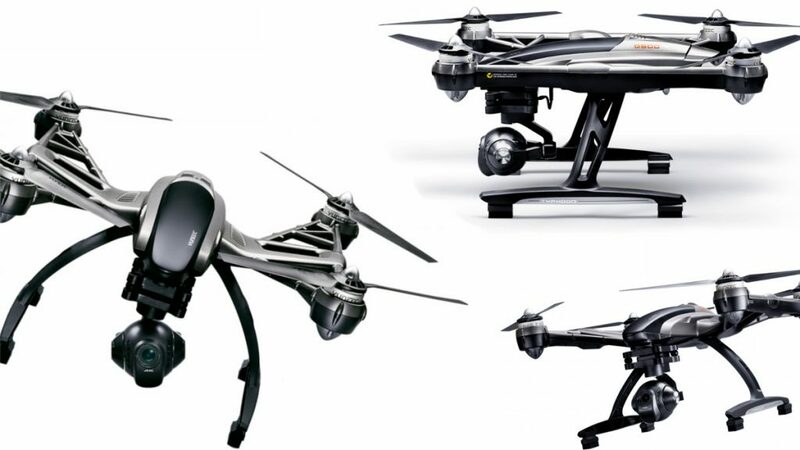 Update: Yuneec has made it official, the Typhoon H Plus is $1,899 with Intel RealSense. 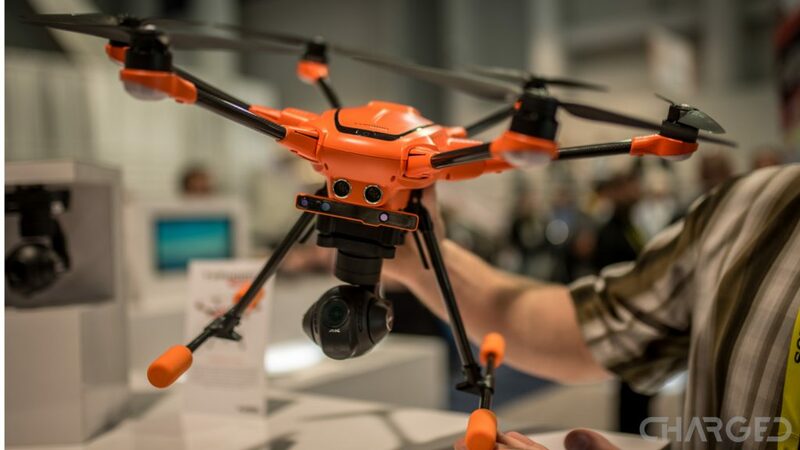 The flagship of the Yuneec line, the six propeller Typhoon H is a large machine built of light-weight materials and vision systems from Intel. Intel RealSense Technology is packed into a short bar on the front of the craft, adding advanced obstacle avoidance and improved object detection. The landing gear is retractable, so you can spin the gimbal any direction you’d like and enjoy an unobstructed view. The proprietary CGO3+ camera is a 12 MP sensor with 4K video recording and a wide field of view lens. For the professionals in the crowd, the Yuneec Tornado H920 Plus is an upgrade from the previous no-plus model. Designed for serious video work, the H920 can handle either the CGO4 camera or you can drop in your own Panasonic GH4. The CGO4 camera is a micro four thirds shooter that accepts some Olympus glass by default. You can choose from a selection of lenses at different focal lengths and zoom levels to capture 16 MP stills and 4K video. You get to choose the glass if you equip your Panasonic GH4, the drone connects to operate it. The Tornado H920 Plus is also the largest drone in the lineup, with a diagonal wingspan of 920 mm, hence the name. Keep in mind that the DJI Mavic Pro is just 335 mm, as a reference. Bottom line, for the pro videographer looking to put a Yuneec drone into the sky, the Tornado H920 Plus is the best solution available. Check it out for $2,799 on Amazon today. 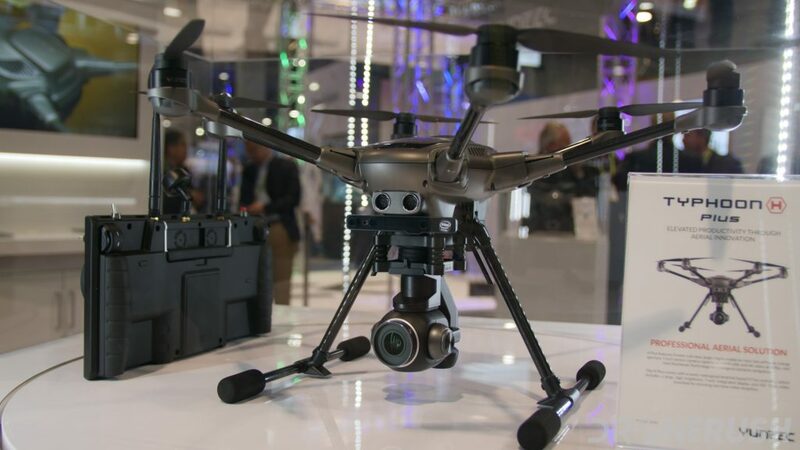 Last, and far far least, the Yuneec H520 is essentially the commercialized and updated Typhoon H. All systems have been improved for the best connectivity possible, and the gimbal can swap into most cameras that Yuneec has to offer. Don’t mistake our words for this being a slight upgrade over the existing Typhoon line, the H520 is a machine like no other from Yuneec. Retractable landing gear, superior connectivity and collision avoidance, the best cameras and an orange paint job make for a reliable and certifiable workplace machine. Expect to see this drone inspecting power lines, radio towers and more in the near future. After meeting with Yuneec at InterDrone 2017, we learned more about this drone. The drone itself is just a cog in the wheel, the full system with the ST16s remote and accompanying software make for an impressive package. Ignoring the systems that make this drone able to be used by Nevada Highway Patrol and more for serious work, you are left with a safe and stable drone. Not bad at all. 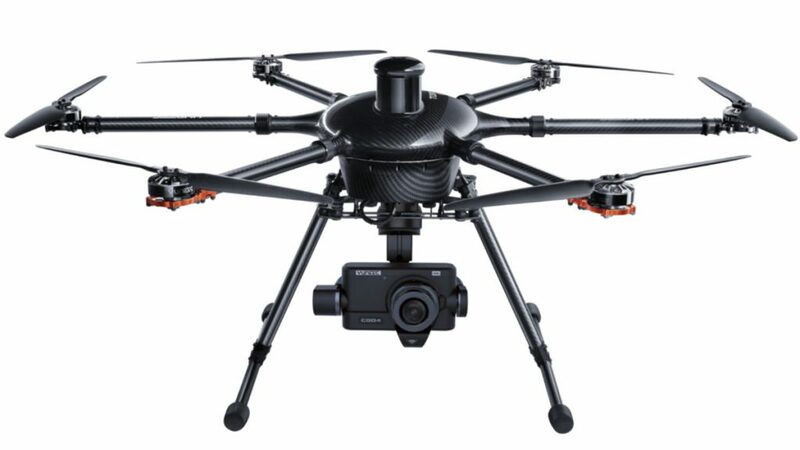 The Yuneec H520 is now up for sale. 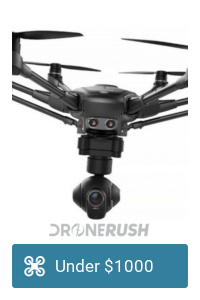 The drone and immediate tools to fly will run you $1999.99, then you’ll need to decide which camera you need, they start at around $1000 each. 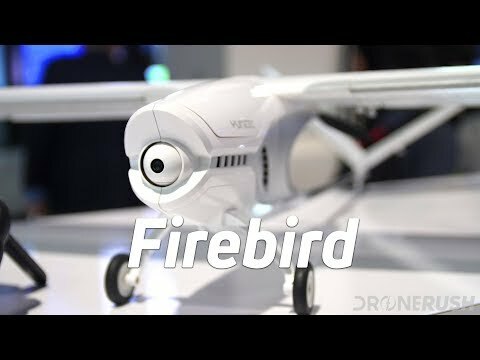 The final announcement from Yuneec at CES 2018, the new fixed wing Firebird FPV. Like many drones out there, there is a 4K camera on the nose of the craft. Unlike many modern drones, however, this is a single-propeller driven, airplane style design. Take-off is easy to do, use a runway or just launch from hand, landing is another story, you’ll want a runway for sure. Yuneec wants flying this drone to be as easy as possible, so unlike many RC aircraft you’ll find many flight assist features in this drone. 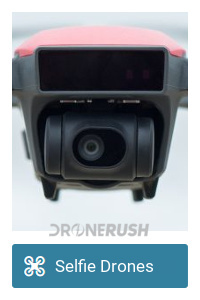 Most notably, the Firebird FPV has RTH functionality. Not bad for a fixed wing craft. You can get your hands on this fun machine later in 2018 for $699. Update: Like the HD Racer, the folks at Yuneec have unofficially informed us to not expect the Firebird FPV in north America. This may change as drone laws change, but as it sits, the benefits of long range drones is lost with the line-of-sight requirements. In addition to the powerful ground stations (remote controls) that Yuneec offers, they have a minimal tool as well. Wizard is a one-handed remote, not unlike your television remote, the offers the most basics of flight controls for most of Yuneec’s drones. In addition to manual controls, the Wizard remote offers direct connectivity to your drone. 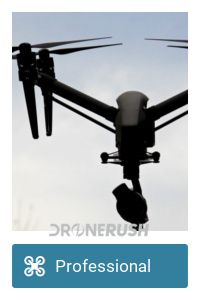 This enables the drone to track you with greater precision than ever. Tuck the remote into the waterproof pouch, strap it to the armband and go enjoy some action sports while your drone captures your every move. Add the Yuneec Wizard to your arsenal for $105 on Amazon today. Although we don’t get to test out electric skateboards on this website, our partner sites do have that fun. 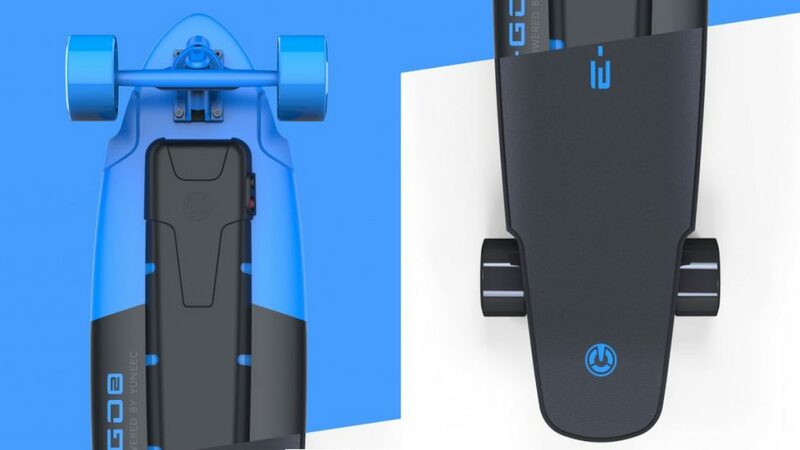 The Yuneec E-GO 2 is on our list of the best electric skateboards with their mid-tier entry into market. We believe Yuneec is an interesting brand to keep an eye on. This is particularly true knowing they have more machines in the works, including an autonomous home security option. In the end, however, they have a limited range of machines, hitting that toy segment very nicely with the Breeze and the higher-end with everything else. We’d love to see a middle of the road type of machine, like the Mavic Pro, to round out their consumer offerings. As it sits, however, Yuneec is one of the first names that comes to mind for professional and commercial drones. 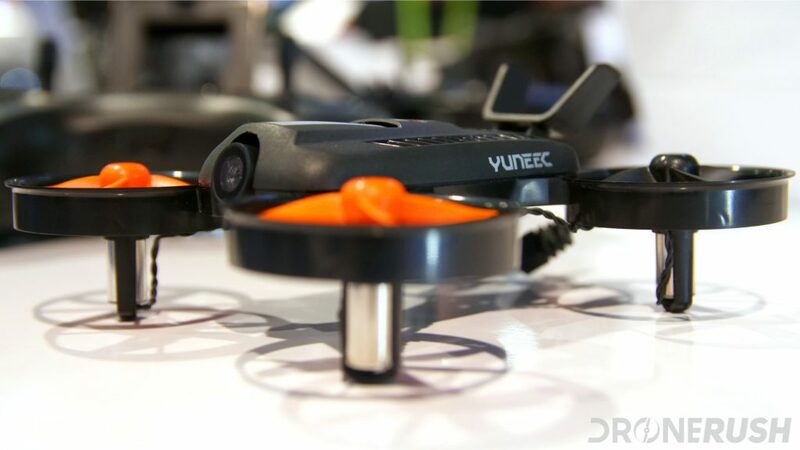 Is Yuneec on your radar, or are these just not the drones you are looking for?